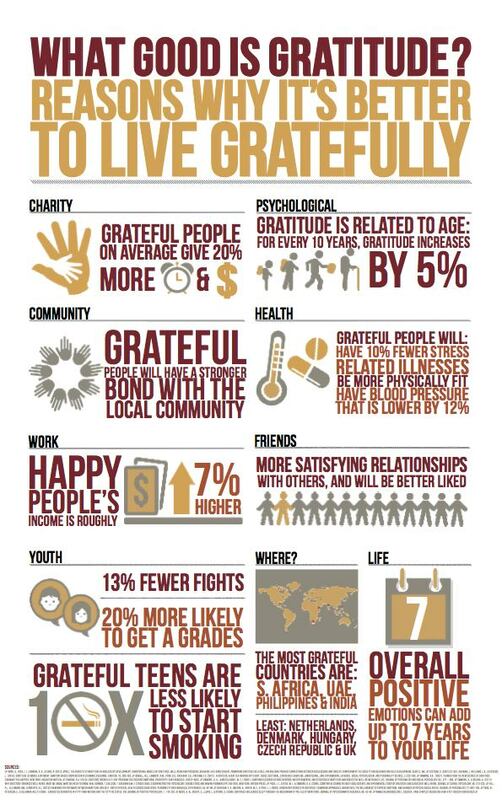 Everyday Gyaan What Good Is Gratitude? You are here: Home / Gratitude / What Good Is Gratitude? Source of infographic – John Templeton Foundation. After getting this information, one has to wonder why not be grateful? You have everything to gain and nothing to lose. 1. the freedom and the opportunity to do the work I love to do and get paid for it (now and then!). 2. family who support and care. 3. inspiration that comes in so many ways. 7. the safety, security and comfort of our home. That is such a good list you have. Lovely infographic, Corrine ! Gratitude does have a wonderful effect on one’s personality, attitude and of course on the lives of those around them. One must be grateful for whatever one already has. Of course, there’s nothing wrong in aspiring for whatever one doesn’t have. However, one should not make the realization of those aspirations the be-all and end-all of life. I agree, counting our blessings makes us realize how much we really have!! Nice infographic! Loved the graphics and so many facts to ponder upon. As they say ‘count your blessings’. Gratitude is definitely the way to go! Our lives take on more meaning with gratitude in them. I especially related to this when doing the Gratitude Challenge on Facebook last month. I love the gratitude attitude! If nothing else, it makes me feel better instantly so it’s worth consciously making an effort for that alone. Today I am grateful for another sunny day, drying my washing outside, living near the sea, the sounds of children playing, and the smell of newly washed hair. Glad to have found you on UBC! That’s a great infographic, Corinne! Gratitude – can’t live without it!